We don’t often think about religious institutions as real estate magnates. Some churches and other places of worship sit on very valuable pieces of land, but the church as a landlord? That just doesn’t compute. Well, we need to think again; at least some sacred places are also the seats of big business, and when that happens, there are issues. As many houses of worship struggle to meet their upkeep and expenses, their congregants are used to being asked for contributions and attend or sell tickets to the occasional special fundraiser. In the meantime, those who sit on the boards of these religious nonprofits must address the costs in their budgets. While exempt from property tax where the edifices sit, they still must deal with aging buildings, crumbling infrastructure that may not meet current code, and congregants with limited funds to contribute. Into this mix comes the blessing and the curse of historic preservation: On the one hand, the mantle of a historic site brings with it funding and eligibility for grants. On the other, the historic nature of one’s building may prevent one from making needed changes. Many find the idea of being a historic site attractive as they fight to maintain houses of worship that stand as lone sources for help in communities in need. In New York City, one church stands out for its savvy use of its physical location, land holdings, and historic preservation status—and general good luck in avoiding disasters. That’s Trinity Church, part of an Episcopal parish in Lower Manhattan that dates to the 17th century. Visitors flock to its cemetery to pay homage at the graves of Alexander Hamilton and his wife, Eliza. But if they look beyond the gravestones, they will see a church that has grown into a $6 billion real estate company. Recent years have been good to the church and the rest of its campus. St. Paul’s Chapel, near the World Trade Center, escaped destruction during the terrorist attacks of Sept. 11, 2001, and now gleams following a fresh coat of paint. After a cleaning in September, Hamilton’s white marble obelisk also sparkles. Soon the entire church—and a new $350 million glass tower under construction behind it—will, too. As Trinity builds and grows, comparisons to megachurches in other parts of the country start to creep in. This may be an apples-to-oranges comparison, as megachurches are more defined by attendance than by their wealth. But the wealth of churches with over 10,000 in attendance at a service might be compared to Trinity as it builds its real estate holdings. 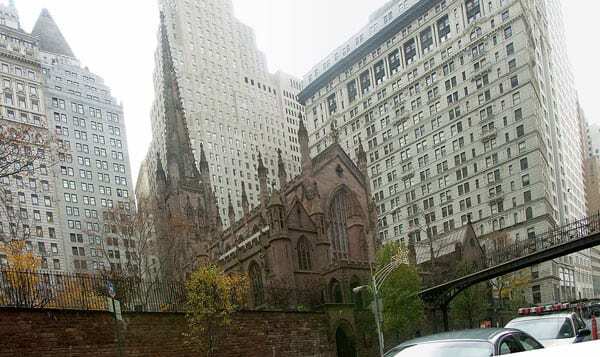 In her article about Trinity and its wealth in the New York Times, author Jane Margolies raises the question of the ethics of a tax-exempt church being such a big player in the New York real estate market. It is in the process of building a $350 million glass tower to house its administrative offices, public gathering spaces, and commercial tenants. It is also renovating the interior of the historic landmark church to the tune of $110 million. Trinity has been able to do all this because it’s been a savvy manager of its resources. It is also, as a church, exempt from taxes. Trinity is very conscious of its mission of care for its flock and others who are less fortunate. Trinity’s wealth enables it to support other churches (it has its own grant department with a formal application process). It has given away $10 million a year and plans to ramp up its contributions, according to the church spokeswoman, Ms. Walsh. It also finances its own humanitarian efforts, including a 325-unit affordable residence for older people and those with disabilities, as well as brown-bag lunches for 35,000 annually. In building the glass tower, it was noted that the residential space plans included luxury apartments. That a church should have these kinds of real estate holdings did not sit well with members of the community. Trinity invited the public to share their concerns, and as a result made some changes that included the addition of an art studio, public gathering spaces, a Sunday school, a basketball court, and a computer lab. While the tower will become much more of a community space at its base, it was not clear if the residential components will remain luxury apartments or affordable, or perhaps a mix.